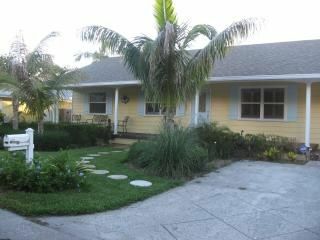 Lovely water front home located off the Loxahatchee River just minutes from the ocean. Close to beaches, Restaurants, and water activities. Enjoy a quiet vacation and fall in love with the beaches and Loxahatchee River. Home of hundreds of species of marine wild life, spot Dolphins, Turtles, Manatees and much more while touring these beautiful waters. Lay back and relax!! !, enjoy a very spacious open floor plan; lots of room for different activities and true vacation amenities! * BBQ and outdoor eating area. * main areas with separate tv sets to entertain children and adults simultaneously. Enjoy a quiet romantic time on our convenient sitting by the water, mornings and afternoons are fun too while lounging at the front porch. Please note: Due to the Town of Jupiter zoning regulations there is a minimum stay of 30 days. Husband and wife local Architects. We bought this property and fully remodeled and furnished this in 2008. We personally enjoy the property with are 3 sons boating and water sports off-season. Very private backyard with lush landscaping. Charming private canal leading to the Loxahatchee River. Great for boating, fishing and watersports. This beautifull single story home features a Living room, Dining room, Den/ office with 46" flat screen Tv., Family Room (open to Covered Patio and Pool Deck with heated pool) with 42" flat screen and Tv. Cd player, Outside covered eating area, beautifull BBQ area with covered trellis and launging chairs. 50' Boat dock, and Covered front porch with seating. Master bedroom with bath and flat screen Tv. 2 additional bedrooms with twin beds secondary bathroom with tub. Beverage center with wine and beverage coolers. Kitchen with seating counter. utensils provided. high speed internet access - washer/dryer - linens provided - ceiling fans in all rooms - BBQ- veranda accessible from main family area - sleeping sofa for an occasional guest - beach towels and reclining beach chairs provided. All specially designed for a very relaxed unforgetable vacation! We had a great experience while staying at the villa. We highly recommend this home. The property is clean and laid out perfectly for a family. We felt at home the moment we walked into the home. The owners are wonderful people. They were incredibly helpful and accommodating to our needs. Our time in the villa was very enjoyable. We highly recommend this property. perfect spot for entertaining and relaxing. Lovely home. The owners are quick to respond to any concerns. Wonderful patio and pool deck for relaxing. Wonderful pool and spa! Our family has been visiting Jupiter Florida for years. We love the atmosphere and the fact that it isn't too "touristy". This was the first time we decided to use a house verses the hotel we normally use. Well, all I can say is..."bye-bye hotel". The Lang's were so gracious to us; the house was beautiful, spacious, well stocked and most of all comfortable! We have a large family that met us there each day to hang out on the deck and enjoyed dinners together in the large kitchen. This house does not disappoint and we will enjoy using it again and again! I almost didn't write this review because I wanted to keep this beautiful home all to myself. We enjoyed every minute of our stay. We felt comfortable and relaxed the minute we arrived. Don and Rosie were wonderful hosts, even taking the time to stop by to make sure that everything was ok.
We look forward to coming back year after year. I like to call this house, "a little piece of heaven." Thank you, Don & Rosie. Beautiful home with lots of space. Rosie and Don were friendly and accommodating. Open floor plan and nicely decorated. Beautiful view of the canal and the neighbors were fabulous! Conveniently located to many attractions and a FABULOUS mall!! Breath-taking view of the canal, the moment you walk through the front door! The living area was wide open and spacious....with all modern amenities! The home was comfortable, yet chic in design! We enjoyed the easy access to Jupiter inlet, cruised by the historic Jupiter lighthouse and sailed out to the Atlantic while taking in the scenery of beautiful waterfront homes owned by such celebrities as Tiger Woods! We took in the beautiful sunset as we lounged in the in-ground swimming pool! The children enjoyed fishing from the dock behind the house. We also enjoyed unique shops and delicious restaurants nearby. Looking for adventure? We found wave-runner rentals were a short distance away. We would,and have, recommended this fabulous villa to families big and small! We are so glad you enjoyed your stay, and appreciate you taking the time to write about your vacation experience and our property. It is our goal to provide our guest with an atractive and comfortable place when vacationing. Good fishing and diving locally. Bicyling and walking down lovely country roads. Ocean beaches, Johnathan Dickinson State Park, Blowing Rocks. Boating, water skiing, all type of water sports. Baseball games at Abacoa ball park. Miami and South Beach is and hour and a half south. Monthly Rate: $5500 Rates subject to # of people and time of the year. Clean up fee of $200.00 added to any stay period. Security deposit required for monthly Rental Reservations. Non-smoking environment please.